It sounds like this movie is about more than fashion fitting different body types; it's about people fitting into the world they belong in, not the world someone else decided for them. Sounds like a winner of a movie for a bit of light-hearted entertainment. Thanks for your review. I would have missed hearing about this movie otherwise. Oh, just when I was looking for something entertaining and away from the reality of my own world. 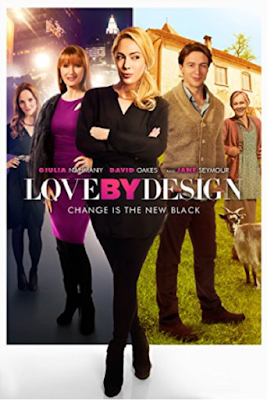 Love by Design sounds like a good movie to just plain enjoy. Sounds like a great movie. I just love it when the underdog comes out on top. Thanks for the review Cynthia, I'll look for this one. Perfect timing! We're having a snow day and this will be the perfect movie to take my mind off of being snowed in. Bring on the bon-bons! Oh my goodness Cynthia, I think you must have read my mind. I love the premise of this movie and the story along with the actresses will make this movie perfect for me! What a great review and I loved watching the official trailer. I think I know what I'll be doing tonight. Cynthia, I'm a sucker for a good romantic movie, and based on your wonderful review I think I'm going to love this one. Thanks so much for letting me know about it! Love romantic comedies the most so this sounds like just the ticket for me. Will be looking for it!